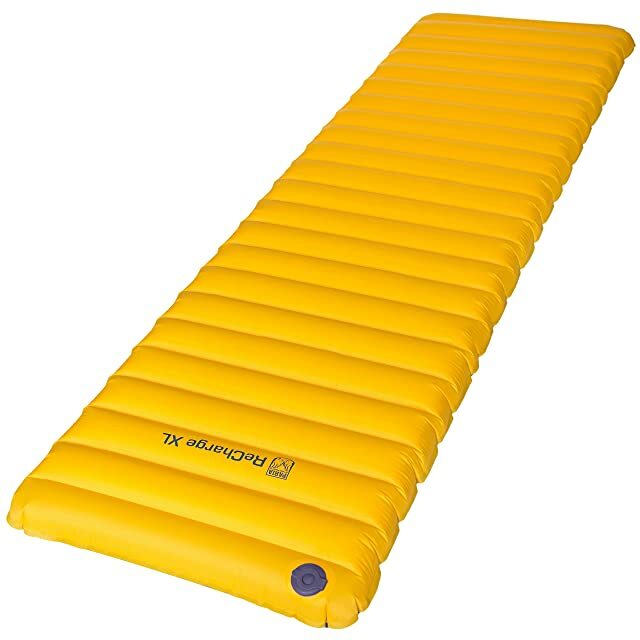 What is a good R-value for sleeping pads? How long does it take a self-inflating sleeping pad to inflate? How do self-inflating sleeping pads work? If you are a frequent camper, you must understand the importance of good night sleep. When you are on the move, energy is all you need for a day. As a result, choosing a good sleeping kit is essential. R-value is a basic specification to indicate under which season or temperature a sleeping pad can be used. For those who want to travel in late autumn, early spring and winter, a high R-value sleeping pad is indispensable. I have to admit that finding the highest R-value sleeping pads for car camping and backpacking isn’t an easy task, especially if you have no background knowledge of sleeping pads’ design and materials. In this article, I will focus on six items with the highest R-value ratings and several common questions regarding sleeping pads. One common feature of sleeping mats for car camping is that they are weighty. The use of better insulation and shell material, as well as the dimensions, contributes to the heft. However, since you don’t have to worry about hosting a sleeping mat around, you can enjoy every benefit it has to offer. The Lightspeed Outdoors Premium Self-Inflating Sleeping Pad is one of the massive kinds that bestow excellent features. It has an R-value of 9.66 indicating its usability under extreme weather. This makes up a good 3-season sleeping mat, especially when you want to travel in early spring, late autumn and winter. This item comes with an XL size, which provides plenty of space for you to sleep. Plus Lightspeed Outdoors adopts what’s called FlexForm™ fabric surface. This new technology allows the manufacturer to deliver the right thickness at a budget-friendly cost and high quality compared to conventional technology. As a result, you can enjoy this snug sleeping mat at a very reasonable price. This pad features a 3-inch foam core with a well-insulating material that secures the heat around your body and prevents cold air from the ground to get to you. What’s more, this product also adopts FlexForm 4-way stretch Polyester for its cover. This is a strong and durable material. It also comes with TPU lamination, which is famous for its elasticity, oil-and-abrasion resistance. Lightspeed Outdoors even adds a half-an-inch pillow for your ultimately comfy nights. One thing that makes me worry about this product is the plastic valves. They look quite fragile, but so far nothing happens, so I’m quite content with my choice. The Lightspeed Outdoors Premium Self-Inflating Sleeping Pad is a wonderful choice for frequent car campers. Plus, this pad comes at a reasonable price that helps you save a few bucks while still delivering great comfort. Therm-a-Rest is one of my favorite outdoor-gear manufacturers. They offer a wide range of products with various features, sizes, colors and prices that could satisfy even the most demanding customers. When it comes to a comfortable night sleep at low temperature, I have to mention their MondoKing 3D Foam Camping Mattress. MondoKing 3D Foam Camping Mattress probably has the highest R-value not only within this list but also in the market. This product offers an R-value rate of 11.4. If you plan on going car camping in late autumn, or even in winter, this mattress should be your top priority gear. No more worry about the cold lumpy ground. Compared to other self-inflating mattresses, the MondoKing features numerous qualities that make you completely comfortable sleeping on it. This item comes in 2 different sizes L and XL. It adopts vertical side walls that help you utilize every inch of the mattress. If you are a not space conscious traveler, then the MondoKing X is way enough for a cozy overnight. What else can this item impress you? My answer is its 4-inch foam core. Therm-a-Rest uses Polyurethane Foam Insulation which grants users a myriad of benefits. This type of insulation has a higher capacity of retaining heat while dramatically reduces the overall price of the product compared to the traditional batt insulation. The mattress cover is made of 75D reverse diamond polyester – the popular and most luxury choice of shell material for utmost comfort. The only trouble I have with this mattress is that it is quite bulky. The weight plus the thickness make the deflating process a daunting task. Other than that, this is a real product of value. So if you are currently looking out for a mattress that guarantees ultimate luxury and relaxation, the MondoKing 3D Foam Camping Mattress is no doubt the best option for you. KingCamp DELUXE Series Thick Self-Inflating Camping Pad is another top-notch choice for car camping. KingCamp series offers four different sizes from single, plus, wide to double. If you are looking for a suitable size for your kids, your wife or girlfriend, KingCamp DELUXE Series is the one you should take a look. As for the R-value, KingCamp provides two different ratings. The single and double size both have an R-value of 7.5, while the other two settles at 10.0. This makes the DELUXE series a suitable sleeping pad for late autumn, early spring, and winter camping. In general, KingCamp DELUXE is thicker than most conventional sleeping pads. Even their single size pad is nearly 3-inch thick. This item uses Jet Stream Foam as insulation. While Jet Stream Foam is famous for its high capacity to keep heat, it is also very portable. Like other sleeping pads for car camping, KingCamp DELUXE is quite hefty, but it can be compressed down to impressive dimensions, thanks to the foam. What’s more, KingCamp utilizes Polyester 150D Oxford as its cover fabric. When it comes to shell material, 150D Polyester makes all the difference. It is one of the most durable polyesters that can withstand great external effects and extended exposure to weather elements. It can resist water and even UV lights. The KingCamp DELUXE can weight up to 11.5 lbs. Even though I only recommend this pad for car camping, the weight is still a big problem, especially when you try to deflate it. The process will take longer and often requires a bit of physical assistance from the owner. Overall, I believe this sleeping pad is a product of great value. I doubt that you can find better products with a similar price as KingCamp DELUXE. KingCamp DELUXE Series Sleeping Pad is great for frequent car-camping trips when durability and comfort are the most critical factors. Foam sleeping pads could be good choices for camping as well. Take a look at my review about the best foam sleeping pads for camping here. Klymit Insulated Static V All Season Camping Compact Sleeping Mattress Pad should be nominated as the best sleeping pad for backpackers. It is one of the lightest sleeping pads you could find in the market. The Klymit Insulated Static V weighs only 35 oz and can be packed down to 5″ x 8″. You can save plenty of space for other important stuff in your backpack. 75D Polyester is used for the cover fabric. This is a standard material, which excels at puncture and abrasion resistance. However, it is also the reason why this item is slightly heavier than the Insulated Static V Lite, which is only 19.6 oz and uses 30D Polyester. If you are looking for the lightest sleeping pad possible, it is better to go for the second option. The Klymit Insulated Static V All-Season offers an R-value of 4.4. This is a standard R-value of an excellent 3-season sleeping pad. I would recommend using this pad for summer, autumn, and spring. This item adopts the V-shaped baffles which regulate air effectively from top to bottom. This system also helps the pad to retain heat and boost the thermal functioning. The side rails are designed to secure your body within the pad and allow you to move and turn without feeling uncomfortable. The only problem is that some people complain about the hollow V-shaped baffles that are not comfy to sleep with especially when you are a side sleeper since your hips tend to fall in between the baffles. While good night sleep is essential, the gear weight is not less crucial. If you are looking for a high h-value but lightweight and affordable sleeping pad, Klymit Insulated Static V All Season Camping Compact Sleeping Mattress Pad is the perfect one. Outdoor Vitals Ultralight Sleeping Pad is another backpacker-friendly product as it weighs only 1 lb for the regular size and 1.6 lbs for the LongWide size. This is a relatively lightweight option for a long and tiresome trail. Both sizes are compressible down to 3 x 6 x 8 inches. It is easy to inflate and deflate. One more plus is that Outdoor Vitals Ultralight Sleeping Pad comes with a pump sack that can make the inflating process less daunting. The pump sack also prevents moistures from regular breaths to cause molds and reduces the durability of the pad. What else that makes this pad a wonderful option for backpacking? It offers extra-large side rails, acting as a barrier that keeps you in the middle of the mat and makes sure your hips stay away from the ground. Outdoor Vitals offer both insulated and non-insulated types, depending on your preferences. This product has an R-value of 4.0, which is great for a 3-season sleeping bag. Usually, I don’t think a 4.0 R-value is reliable for late autumn or early spring; however, this item is quite thick. Both sizes are above 3-inch thick, and that makes me a bit less skeptical when using the Outdoor Vitals Ultralight Sleeping Pad for late autumn or early spring. Outdoor Vitals uses the ultralight 20D ripstop polyester. Ripstop polyester can resist tearing or ripping. It is a sturdy and durable material for outdoor purposes. So far, I think the vertical baffles are the only drawback of this sleeping pad. This is indeed not a good choice for side sleepers. You are looking for the Best sleeping pads for side sleepers? Take a look at my other article. 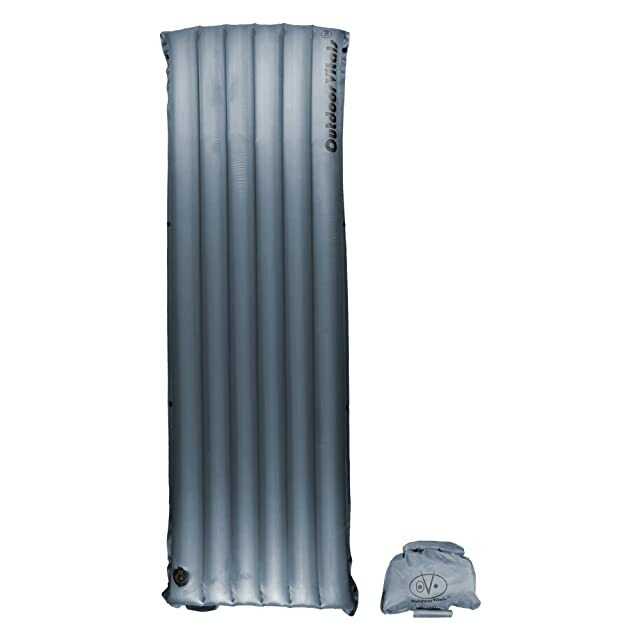 Outdoor Vitals Ultralight Sleeping Pad is a reasonably priced item for backpackers who opt for long walking trails. This product comes with a quick pump sack that protects the pad from molds and reduces the physical stress of inflation. Nobody wants to find out their sleeping pad is too uncomfortable to sleep on after a long tiring walk. Well, if you choose Paria Outdoor Recharge Sleeping Pad, you will surely have a good sleep. Paria Outdoor offers two sizes UL and XL with two different R-value. The UL size has an R-value of 3.5 while the XL one has 4.7. While the UL Recharge Sleeping Pad is more compatible for summer, early autumn, and late spring. The XL is excellent when it comes to camping in late autumn or even in winter. The XL is also 4-inch thick, ensuring that your hips will well-secured on the pad and the heat will be distributed evenly throughout the surface. Paria Outdoor uses 40 Denier diamond rip-stop nylon. Compared to Outdoor Vitals Ultralight Sleeping Pad, which uses the 20D ripstop polyester, Paria Outdoor offers a stronger and thicker shell fabric. This material is also puncture and abrasion resistant. The horizontal baffles are what I like the most. They feature sealed microfiber for better insulation. The dual valves work perfectly. What don’t I like about this pad? Probably because of the noise it creates. The noise isn’t too loud though, for a light sleeper like me, it is quite annoying. 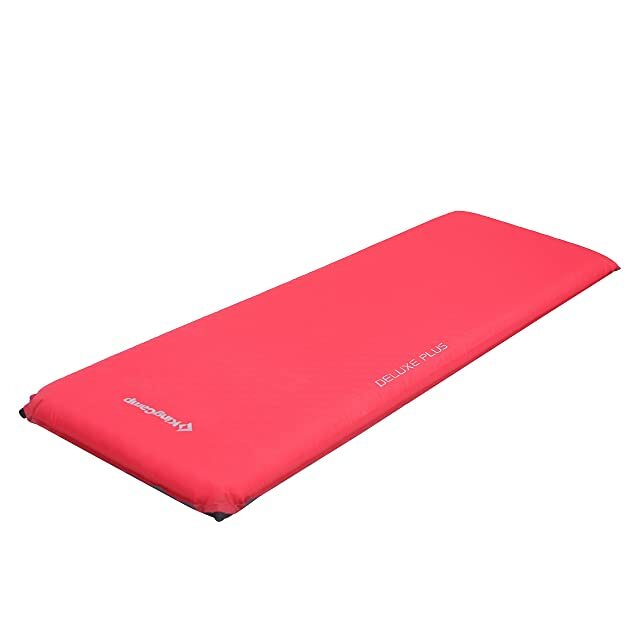 So if you are looking for a budget-friendly with great-features sleeping pad for your upcoming hiking trips, I would recommend Paria Outdoor Recharge Sleeping Pad. For those who love self-inflating sleeping pads, take a look at my recent article about the Best self-inflating sleeping pads. R-value determines how good one sleeping pad’s insulation is. The higher the R-value is, the better it can retain heat. When choosing a sleeping pad, it is essential to aim for the suitable R-value for your camping purposes. For example, if you are a backpacker, chances are you want to have a lightweight sleeping pad. 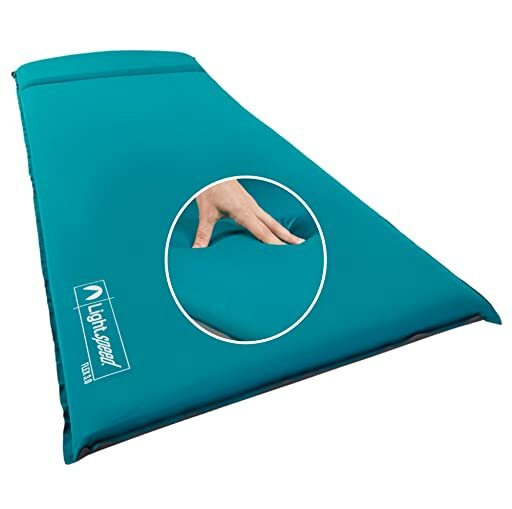 Most portable sleeping mats will offer an R-value from 1.5 to 5.0. Pads with R-value under 3.0 makes the best companion for summer, early autumn, and late spring camping while the higher R-value sleeping ones would be suitable for cold weather in late autumn or winter. As for car camping, most sleeping pads are hefty. Therefore, the R-value is also higher. Sleeping pads’ R-value for car camping can be as high as 10 or 11. Depending on your budget and preferences, you can choose the suitable R-value for your upcoming trips. When I first bought my self-inflating sleeping pad, I waited a good hour for the pad to inflate itself. After that, I found out that sleeping pad only requires several minutes or so to be fully inflated. So the key is to wake up the open cells as soon as you get the pad. Waking up the cells here means that you should inflate the pad yourself. Just give it a few breaths and let the pad inflates itself later. After that, you can roll it back in. Next time you use the pad, it only takes 2 or 3 minutes to fully inflate. If you ever wonder the secret behind a self-inflating sleeping pad, this is where you can find the answer. Self- inflating pads adopt PU foam which has a lot of open cells. These cells can stay extremely compressed when you pack it. Once you release the pad, the cells expand. As soon as the valve is open, the cells will vacuum and quickly fill the pad with air. 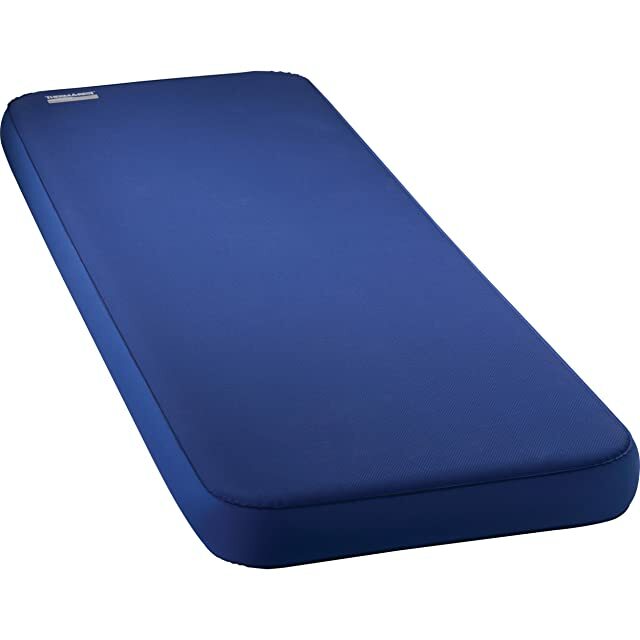 In most case, you still need to give the pad a few breaths or adjust the firmness as you wish; however, this type of sleeping pads doesn’t require much of physical strength as their manual inflating counterparts. To wrap up, I know finding the suitable sleeping pad with an ideal R-value is overwhelming sometimes. However, you should not jump into the pool of choices without knowing what it has to offer. I hope that the list of 6 highest R-value sleeping pads for car camping and backpacking could help you determine which features, prices, design and most importantly the R-value you want your sleeping pad to have.